Thirty years ago, the world was introduced to an amazing race of robotic aliens, exiled on our world after a terrible war on their own planet. 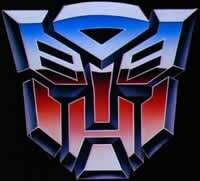 There were two factions; the noble Autobots and the nefarious Decepticons. The first Transformers cartoon was a fantastic series of yarns about honor, sacrifice, courage, and kinship in the face of overwhelming odds. Fans yearned for the day when a live-action version of the transforming robots would come to the big screen. And then Michael Bay brought us...what he brought us. With his dark henchmen Alex Kurtzman and Roberto Orci, Bay destroyed the once proud heritage of these magnificent creatures, replacing it with a legacy of piss jokes, robotic racism, and murderous Autobots. This was not the Transformers I grew up with. And I'll be damned if Bay's abominations become the legacy of Cybertron. And so, without further ado and with much humility, I present my own reboot of the franchise. Millions of years ago, an alien spaceship crashed on Earth. The robotic aliens aboard the ship perished, damaged beyond repair and fossilized by time. However, in the mid-1800s, that ship was discovered during a dig in the Sahara Desert. The British and French governments, as the ship was on the border between their colonial territories, cordoned off the crash site and spent the next century exhaustively studying the craft. While the world's best scientists were never able to reactivate the ship or salvage the corpses of the aliens, they were able to — over decades — reverse-engineer technology from the ship and the corpses. Many other governments - including the United States, Soviet Union, Germany, Japan, China, and the Ottoman Empire - gained the technology as well over the years, through alliances or espionage. Things came to a head during World War II, when the United States deployed their first two Deceptive Constructs, large robots able to infiltrate enemy territory by posing as a ship, military truck, or plane. The robots destroyed the Japanese cities of Hiroshima and Nagasaki, ending the war. The United States did not have long to savor their "secret" weapons; within two decades, several other governments had their own Deceptive Constructs, and a Cold War brewed that lasted for the rest of the twentieth century. But though the specter of mutual robotic annihilation loomed, the technology behind the Deceptive Constructs did not stay within the military-industrial complex. Civilian versions of the machines, known simply as Autonomous Robots, began seeping into all aspects of human civilization. By the dawn of the twenty-first century, millions of "Autobots," as they became colloquially known, were spread throughout the world. Both the Autobots and the Deceptive Constructs — or "Decepticons" — eventually became self-aware, each robot's personality dependent on what kind of people and environment he or she was habitually exposed to. All of this will be shown during the prologue and an opening credits montage. Our story begins with Orion and Pax, two brothers separated by their careers but deeply connected through kinship. Orion works as a construction and transport robot for a nonprofit organization, helping to build shelters for homeless people in his robot form and transporting lumber and equipment in the form of a semi truck. Orion is idealistic and compassionate, influenced by the kind and quiet Spike Witwicky, the head of the non-profit. Pax is a Deceptive Construct with a black ops squad, going on many missions where he is forced to kill people and destroy Autobots and other Decepticons. This takes its toll on Pax, and he begins to think there are no redeeming qualities about humanity. However, Pax's human squadmates are kind to him, and their kindness as well as regular visits with Orion keep Pax clear-headed. All that changes during a mission in South America. Learning a terrorist organization is planning to launch a cyber attack that will infect all Autobots and Decepticons with a virus which will turn them against humanity, Pax and his squad move in to stop the threat. Operation Megatron, named after the virus's codename, is a success. The virus and terrorists are destroyed, but Pax's entire squad is killed and he is heavily damaged. Pax makes his way back to his home base, where he is inconsolable at the loss of his team. The general of the base explains to Pax that sometimes tragedies happen in combat, and that's just the way the world works. Interpreting the general's words as apathy about the death of his friends, and overwhelmed by all the ugliness he has witnessed in his time as a black ops operative, Pax snaps. He completely obliterates the base and murders its personnel during his psychotic rampage. Pax concludes that conquering humanity is the only way to stop all of the tragedy he has witnessed. Renaming himself Megatron to always remind himself of why he must conquer the world, the robot flies off to recruit others to his cause. Megatron first visits Orion, who is horrified by his brother's actions. Orion begs Megatron to turn himself in and get some help, but Megatron angrily refuses and departs. Orion, wanting to give Megatron the chance to see reason, seeks the counsel of Spike, who tells him that perhaps someone at the upcoming Autobot Conference will be able to help. Megatron travels the world, recruiting many Decepticons to his cause. His first recruits include the orbital spy satellite Starscream, the crowd control unit Soundwave, the explosives expert Shockwave, the aerial drone Skywarp, and the support tank Cyclonus. Many other Decepticons, including the military expert Ironhide, refuse to join Megatron. Megatron does not try to recruit any Autobots — except for Orion, only because they are brothers — due to their civilian natures, which he deems useless to his plans. However, Starscream suggests that when the Decepticons launch their attack on humanity, the Autobots could be turned into a fighting force that could overwhelm the Decepticons, citing a mysterious "Prime Project." With Starscream's urging, Megatron makes plans to attack the Autobot Conference, the annual gathering of Autobots and techie humans that showcases new developments in Autobot technology. Just before the conference, Megatron visits Orion again. The Decepticon leader begs his brother to join the Decepticons, and when Orion yet again refuses, Megatron warns him to at least not go to the conference. When Orion asks why, Megatron simply repeats his warning and flies off. Orion tells Spike about Megatron's warning, and the two inform the authorities. Orion meets the police Autobot Prowl, who takes his and Spike's concerns seriously and promises to beef up security for the conference. At the Autobot Conference, Orion and Spike meet a variety of Autobots, and even some Decepticons who are still on the side of humanity. Orion meets the cocky race car and mechanic Hot Rod, the Harlem urban renewal robot Jazz, the Rescue Construct Arcee (who turns into a fire engine), the aging children's entertainer and movie star Bumblebee (who keeps his classic Volkswagen bug design; he also played the eponymous character in the Herbie series back in the 60s and 70s), the marine researcher Ariel (named by her human coworker after the character in The Little Mermaid), the clumsy inventor Wheeljack, Ironhide, and the laconic paleontology professor Grimlock. Orion gets along very well with the group, and Spike hits it off with the human companions, particularly Wheeljack's nanotech expert colleague Carly Miller (who is much closer in appearance to her cartoon version — no "supermodels" in this film). The conference is attacked by Megatron's forces, who massacre the attendees. Most Autobots and human-aligned Decepticons are killed, as are many humans. Ariel's human best friend Elita Dane, Ironhide's mentor, Grimlock's students, Arcee's fire station colleagues and many of the children Bumblebee was entertaining are killed in the attack. Orion and Ariel are heavily damaged in the massacre, which is stopped only by Ironhide and Prowl rallying the surviving human-aligned Decepticons against Megatron's forces. Spike learns from Wheeljack and Ironhide that Orion and Ariel are dying, and there's only one hope of saving them...and even that's a long shot. Wheeljack, Jazz, Ironhide, Bumblebee, Hot Rod, Prowl, Arcee, and Grimlock bring Orion and Ariel to Trion Enterprises, where the Autobots and Decepticons were built. There, they meet Alpha, the first Autobot and the one who has built all others. Alpha tells the group that Orion and Ariel are optimal candidates for the Prime Project, which will not only upgrade them exponentially, but make them more than a match for Megatron and his army. Alpha offers to upgrade all of the Autobots, who accept. However, Alpha has only finished upgrading Orion and Ariel when the factory is attacked by Megatron's forces, who have finally learned the location of the Prime Project. Alpha is killed in the attack, the factory is destroyed, and the upgraded but unconscious Orion is abducted by Megatron. Ariel awakens, and enraged by the grief of losing her human friend, vows vengeance against Megatron. She renames herself Elita Prime and takes command of the Autobots. She promises Spike that she will find Orion and rescue him. Ironhide and Wheeljack develop an idea of how to locate Megatron's forces. At Megatron's mountain sanctuary, Orion awakens. Megatron comments on the change in Orion's appearance, and tells Orion he is now a perfect soldier for the conquest of humanity. Orion not only refuses, but tells Megatron in no uncertain terms that he will face justice for what he has done. The enraged Megatron attempts to kill Orion, but the Autobot reveals his new weapons arsenal, including an arm-mounted cannon and taser darts. Even though Megatron tries to kill Orion repeatedly, Orion refuses to do the same, instead trying to merely disable the Decepticon commander. As the rest of the Decepticons flank Orion, the mountaintop comes under assault by the Autobots and their human allies. The battle is brutal but swift, ending with the Autobots prevailing over the Decepticons. Orion saves the lives of his new Autobot and human friends many times over. However, Spike is mortally wounded in the battle when he throws himself in the path of a killing shot meant for Orion. Spike dies in Orion's arms, telling him that Alpha was right — Orion really is an "optim...Prime..." When Orion asks him why he took the shot meant for Orion, Spike's last words are "no sacrifice...no vi..."
Orion, overcome by the death of his best friend, launches a harrowing attack on Megatron. The two brothers pummel each other until Orion at last rips the cannon from Megatron's shoulder, greatly injuring the Decepticon leader. However, Orion stops himself from killing Megatron, remembering the lessons Spike had taught him. However, Elita has no such compunction. She tries to decapitate Megatron, but is stopped by Orion. Orion, holding Elita back, orders Megatron and the rest of the Decepticons to leave Earth and never return. The Decepticons do so, but Megatron swears he will return to finish what he started. Elita, enraged by Orion's "weakness," demands to know who Orion thinks he is. Orion, remembering what Spike had called him, answers, "I am Optimus Prime. I stand between us and the darkness. Even the darkness within ourselves." Elita calls Optimus a fool; telling him that one day Megatron will return and everyone will pay the price for Optimus's mercy, and swears that she will destroy Megatron and the Decepticons before that can happen. She flies off; Arcee, Bumblebee, and Grimlock join her — Arcee to try to calm her down, Grimlock and Bumblebee because they want to avenge the deaths of their human friends as well. As Optimus Prime watches the rogue Autobots vanish into the distance, he is joined by Jazz, Wheeljack, Prowl, Hot Rod, and Ironhide. Wheeljack asks Optimus what the plan is. Optimus replies that Elita was right about one thing: one day Megatron will return, and they need to be ready. So that's the story. I hope it recaptures the spirit of the Transformers while at the same time bringing something new to the mythos. I should add that this is only the first part of a fully mapped-out trilogy, but I won't get into the sequels until I know how this is received. There would be minimal CG in the film, and the Autobots and Decepticons will look almost exactly like their G1 forerunners with the fewest of tweaks to reduce ridiculousness. I'd even try to build life-size props to give the human actors something to really play off of, and the cast would be chosen based on their talent and love for the franchise as opposed to their looks or bankability. And hopefully, this new tale will get that nasty Bay aftertaste out of everyone's memories.